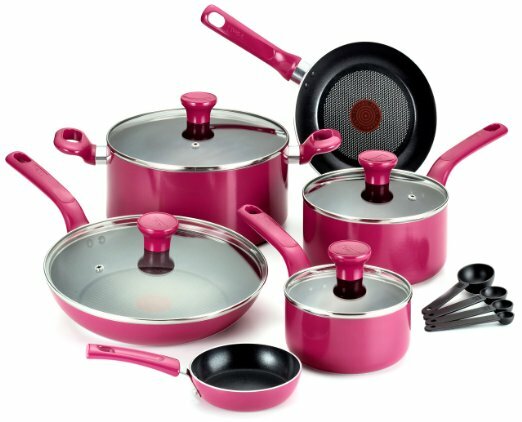 This T-fal Excite Pink Nonstick Thermo-Spot Cookware Set features a thermo-spot heat indicator (fry pans only) that show when the pan is perfectly preheated. The even heat base allows for even heat distribution, while the non-stick interior is scratch resistant making cooking and cleaning easy. Ergonomically designed handles are color-matched and oven-safe up to 350 degrees, allowing for an easy transition from stove-top to oven. 14-piece set. $112.99 Sale $72.14. Buy here.